Do not meddle in the affairs of poles, for they are subtle and quick to leave the unit circle. This section describes the basic ideas behind CELP. This is still a work in progress. 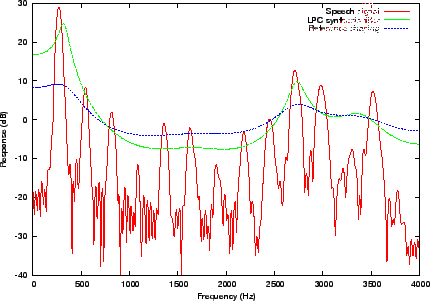 The source-filter model of speech production assumes that the vocal cords are the source of spectrally flat sound (the excitation signal), and that the vocal tract acts as a filter to spectrally shape the various sounds of speech. While still an approximation, the model is widely used in speech coding because of its simplicity.Its use is also the reason why most speech codecs (Speex included) perform badly on music signals. The different phonemes can be distinguished by their excitation (source) and spectral shape (filter). Voiced sounds (e.g. vowels) have an excitation signal that is periodic and that can be approximated by an impulse train in the time domain or by regularly-spaced harmonics in the frequency domain. On the other hand, fricatives (such as the "s", "sh" and "f" sounds) have an excitation signal that is similar to white Gaussian noise. So called voice fricatives (such as "z" and "v") have excitation signal composed of an harmonic part and a noisy part. The source-filter model is usually tied with the use of Linear prediction. The CELP model is based on source-filter model, as can be seen from the CELP decoder illustrated in Figure 1. Because is toeplitz hermitian, the Levinson-Durbin algorithm can be used, making the solution to the problem instead of . Also, it can be proven that all the roots of are within the unit circle, which means that is always stable. This is in theory; in practice because of finite precision, there are two commonly used techniques to make sure we have a stable filter. First, we multiply by a number slightly above one (such as 1.0001), which is equivalent to adding noise to the signal. Also, we can apply a window to the auto-correlation, which is equivalent to filtering in the frequency domain, reducing sharp resonances. where is the pitch period, is the pitch gain. We call that long-term prediction since the excitation is predicted from with . where and in the Speex reference implementation. If a filter has (complex) poles at in the -plane, the filter will have its poles at , making it a flatter version of . 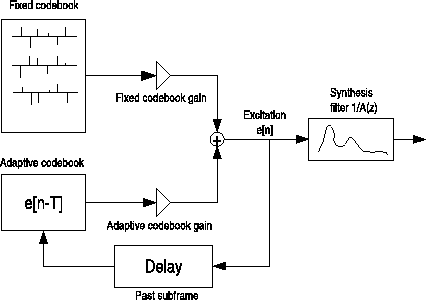 The weighting filter is applied to the error signal used to optimize the codebook search through analysis-by-synthesis (AbS). This results in a spectral shape of the noise that tends towards . While the simplicity of the model has been an important reason for the success of CELP, it remains that is a very rough approximation for the perceptually optimal noise weighting function. Fig. 2 illustrates the noise shaping that results from Eq. 1. Throughout this paper, we refer to as the noise weighting filter and to as the noise shaping filter (or curve). Figure 2: Standard noise shaping in CELP. Arbitrary y-axis offset. One of the main principles behind CELP is called Analysis-by-Synthesis (AbS), meaning that the encoding (analysis) is performed by perceptually optimising the decoded (synthesis) signal in a closed loop. In theory, the best CELP stream would be produced by trying all possible bit combinations and selecting the one that produces the best-sounding decoded signal. This is obviously not possible in practice for two reasons: the required complexity is beyond any currently available hardware and the ``best sounding'' selection criterion implies a human listener. In order to achieve real-time encoding using limited computing resources, the CELP optimisation is broken down into smaller, more manageable, sequential searches using the perceptual weighting function described earlier.